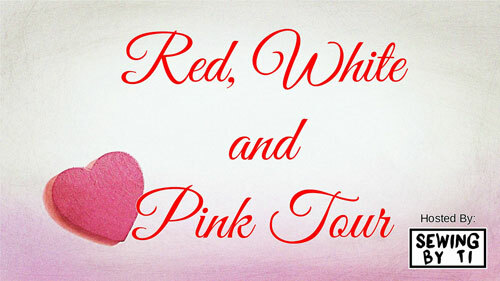 Red, White, and Pink Tour – Everything Your Mama Made & More! I’ve been quiet for the last month because, honestly, I’ve been feeling less than inspired to sew. It’s so cold out that I just want to crawl under a blanket and hibernate! However, when Tibeca of Sewing by Ti announced that her monthly tour would be Red, White, and Pink, I knew it was the perfect opportunity to sew up the fuchsia double brushed poly that I got from her fabric shop Simply by Ti a few months ago. When I pulled it out of my stash, my 9-year-old’s eyes lit up at the beautiful color, so I knew it’d be made into something for her. Last week, she spotted a dress that had a heart cutout on the back and she fell in love with it. Problem was that it was a women’s size dress and wouldn’t fit her, so she turned to me and asked if I could make one like it. I decided to start by mashing Carlie’s Dolman Top and the Girl’s Capsule Skirt and take it a step further by lining the top and adding a second layer of the skirt. Her measurements put her into a size 14 for both top and skirt, so I first cut out all the pieces for both, shortening the top to measure 17 inches from the shoulder since that’s where we wanted the waist seam to hit her. Then I cut out another whole set of the top and skirt, but shortened the sleeves 1.5 inches and cut the skirt at the size 7 hemline. Then I laid out all my scraps to find 4 pieces that were big enough for pockets because who doesn’t love pockets? I added the heart cutout before constructing any other part of the dress. I first drew out the shape, traced it on lightweight interfacing, trimmed around it and ironed it on the right side of the bodice back with the longer sleeves (which would become the lining of the dress’s top). I added the interfacing to help the knit fabric keep the heart shape. I put that piece’s wrong side to the shorter sleeved back piece’s right side and stitched on the line of the heart shape. I trimmed away the inside of the heart, leaving about 1/4 to 3/8 inch inside. I then clipped into that allowance around the heart’s curves and at the point and trimmed off the allowance at the top dip of the heart. Finally, I turned it right sides out and top stitched around the heart outline. To finish the dress, I carefully sewed up the 2 dolmans so the longer sleeved one sat inside, then sewed the skirt pieces together with the shorter skirt on top of the longer. I attached the top and skirt with a circle of wide gold elastic sandwiched in the seamline for a built-in waistband/belt. 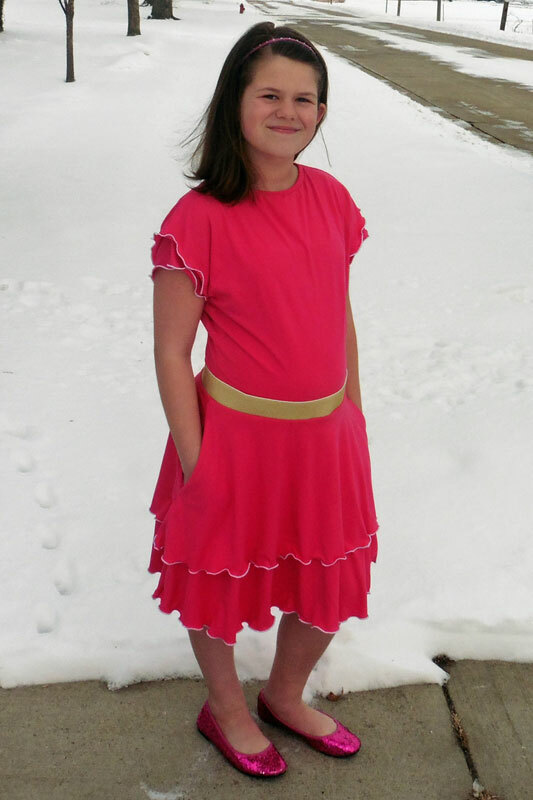 Rather than properly hemming the 4 sleeves and 2 half-circle skirt hems, I decided that a ruffley rolled hem would be the perfect touch for this girly look. 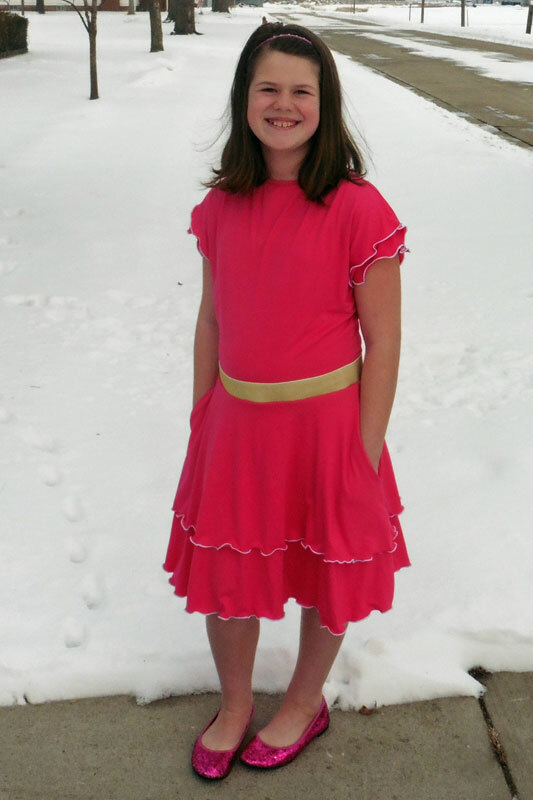 My daughter is thrilled with her new PINK dress with a heart cutout. She likes it so much that she barely complained about going out in the 24*F weather to take pictures! She’s such a trooper! Thanks! It was definitely chilly … I went without a coat, too, so I knew wouldn’t keep her out longer than necessary (and it made her feel a little better that we were both cold, haha). She is so cute in her adorable dress! Great job mom for coming through! I also had a hard time getting back into sewing after the holidays–maybe it was the cold for me too? I’m glad you’re back at it! The dress is lovely. I definitely think the holidays played into my sluggishness come January. Once I power through all the holiday sewing and then the fun part of winter is over, I just want to hibernate! Haha! Thank you! I love this project!! This is so inspiring, the back detail is so fun! I would love to make this as well for my girls. Thanks! If you make one, we’d love to see you share it in the EYMM Facebook group. How fun is that heart cut out.